Kenzo Shirai dazzled the field at the 2017 World Championships. Not only did Japan’s latest superstar win two gold medals on Floor Exercise and Vault but he also secured a surprise first World medal in the All-around competition. Back in action at the American Cup on 3 March, all eyes will be on the 21 years old, keen to see what surprises he has in store for the new season. It takes a special athlete to have a sporting skill named after you. Shirai already has six. Even if eponymous skills are more common in Artistic Gymnastics than other sports, there is no man in history with more to his name than Shirai, who counts three innovations on the Floor as well as three on the Vault. The five-time World champion and two-time Olympic medallist has made his name as an apparatus specialist. Going into the 2018 season, he is working on a masterplan to expand his repertoire and become an All-around contender ahead of the Tokyo 2020 Olympic Games. Shirai’s Japan team-mate Kohei Uchimura, the two-time Olympic All-around champion, has dominated the event for a decade. But the 21-year-old Shirai is not overawed by competing with the man he has described as his role model. But then, Kenzo Shirai has been surpassing expectations since day one. He was still in school when he burst onto the international Gymnastics scene at the 2013 World Championships in Antwerp. Aged just 17, and the youngest man ever to compete internationally for Japan, he became the first athlete to perform a quadruple twist (a move that would become known as “the Shirai”) on his way to winning gold in Floor Exercise. Three of Shirai’s eponymous moves were born at that event, earning him the nickname Mr Twist. He repeated the feat at the 2015 World Championships in Glasgow, reconquering his Floor Exercise title while clinching the gold with the Men’s Team – a gold that Japan had been dreaming about for decades. The Japanese team followed up that success with gold in at the Rio 2016 Olympic Games, as Shirai became the first Japanese teenager to win an Artistic Gymnastics Olympic title. He added the bronze medal in Vault but suffered his first major setback in Floor Exercise. Billed as the pre-Games favourite, Shirai ended up finishing fourth in the final, with the patriotic Brazilian crowd creating a heated atmosphere. Like any great athlete, he resolved to learn from his mistakes. “In qualifying I went for it too much, and in trying to correct that I ended up with something that was neither here nor there. I learned today how important it is to be confident,” Shirai said after the event. These were not just words. Shirai’s progress since Rio 2016 has shown his burning desire to improve. He is a gymnast who continues to reinvent not just his sport, but also his place within it. At the first World Cup meeting of 2017 in Melbourne, Shirai returned to the fold with a fire in his eyes and some new strings to his bow. He won a surprise gold on Horizontal Bar and a silver on Parallel Bars, as well as dominating the Floor and Vault events. At the 2017 World Championships in Montreal, he retained his Floor Exercise title and also clinched gold for the first time in the Vault. But it was Shirai’s bronze medal in the All-around that was perhaps most significant. While six-time world champion Uchimura missed the event due to injury, Shirai’s success pointed towards a future that all of Japan dreams of. With the 29-year-old Uchimura expected to continue competing until 2020, the pair are likely to duel on the world stage many times in the coming years. 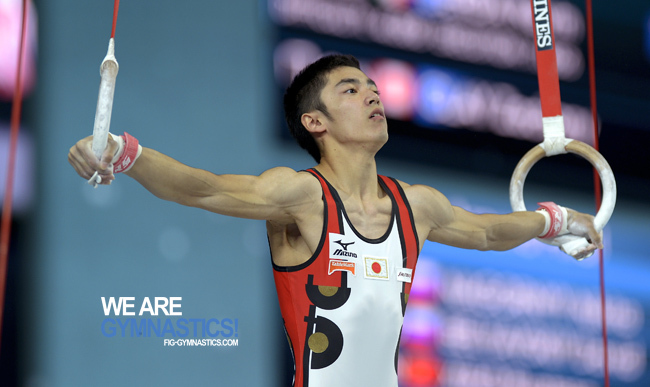 “If Kohei-san were competing I would have probably been fourth. It’s just that he happened to be injured, and I don’t feel like I’ve surpassed him. My next goal is to become No. 1 in Japan," Shirai said. As he prepares to start the 2018 season with the American Cup, we may be about to see the next stage in the evolution of this phenomenal gymnast. And as he spreads his wings across the sport, there’s no telling where his next entry into the rulebook might appear.